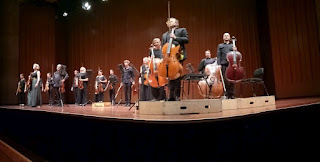 This was other (extant) Bach Passion performed in Canberra. Igitur nos with St John Passion at the other Manuka venue, St Paul's. It was a more moderate affair but no less satisfying. 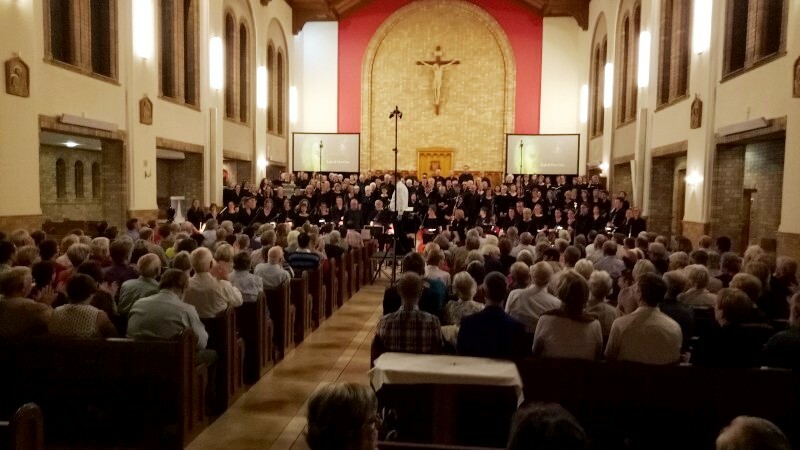 Only one orchestra of 14 players (small so that one muso suggested only half an orchestra) with Evangelist and soloists and a smaller but still involving, powerful and skilled choir of 23 singers. This was shorter and more accessible than the St Matthew Passion. More accessible because it was more comprehensible, being in English. The version was the Bärenreiter Urtext in both German and English, but this was sung in the English and it made a huge difference. 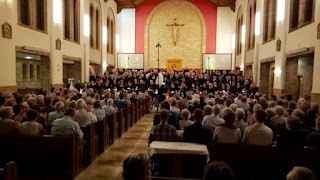 I followed the text (given in the program with just minimal changes from that sung), but mostly I could catch the words, at least from the solo Evangelist who told the story; some of the choral parts were not so immediately clear and often repeated lines rather than narrated. I caught a few details of the story that I'd missed, names like Caiaphas and Annas and Malchas and a hyssop branch and the like. I was thrilled by the chorus when it entered, all big and full and often contrapuntal, and awed by the Evangelist's job on the night. Evangelist Daniel MacMillan was trained at ANU but is living in WA at present; he was flown over for this performance. The complexity of his job had me wondering if his part was originally improvised. It certainly wouldn't be these days. 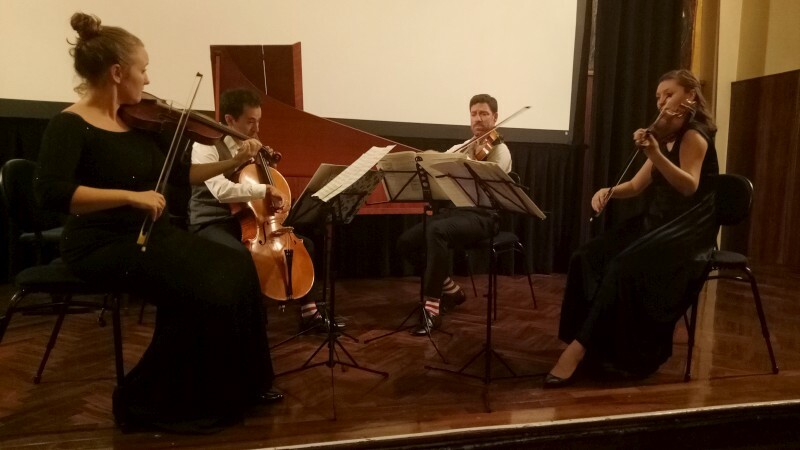 We had prime seats and enjoyed watching the strings, just metres from us, not least Kyle, busy on bass, and Greta who both played viola and stood to sing occasional soprano parts. And the guidance of Matthew Stuckings who got all this together and conducted. It was standing room only for the performance, on an afternoon with setting sun raising temperatures in the church and a smaller experience than St Matthews but another hugely satisfying performance. Truly a blessed Easter. 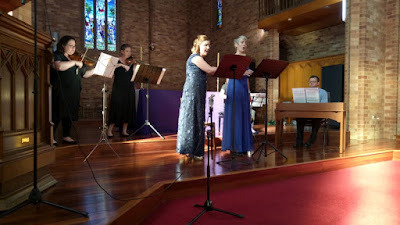 Igitur nos performed JS Bach St John Passion on Good Friday at St Paul's Manuka. Matthew Stuckings (conductor) led Igitur nos chamber choir and orchestra with Daniel MacMillan (Evangelist), Greta Claringbould (soprano), Veronica Thwaites-Brown (mezzo-soprano), Charles Hudson (tenor), Colin Milner (baritone, Jesus). Like this! Five boxes, each containing 100 CDs. 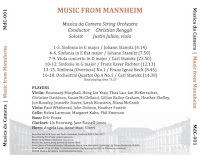 Musica da Camera has just received its printed CD release, Music from Mannheim. It's a live recording of early, formative classical music recorded at St Peter and Paul's Catholic Cathedral in Goulburn in Nov 2017. MdC is a string orchestra, this time led by Christian Renggli with viola soloist Justin Julian and augmented with four wind players for the viola concerto. 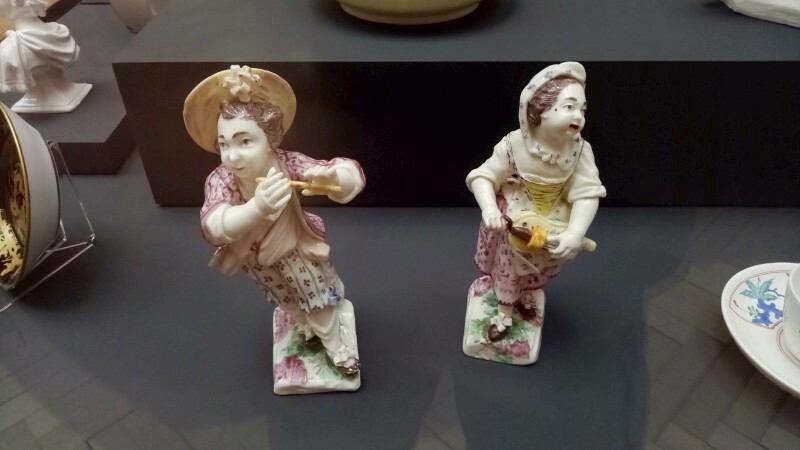 The Court of Mannheim is important for the early development of classical music, was influential for Mozart and the like, introducing a string of innovations. The works were from the pens of the Johann and son Carl Stamitz, FX Xavier and Franz Beck. 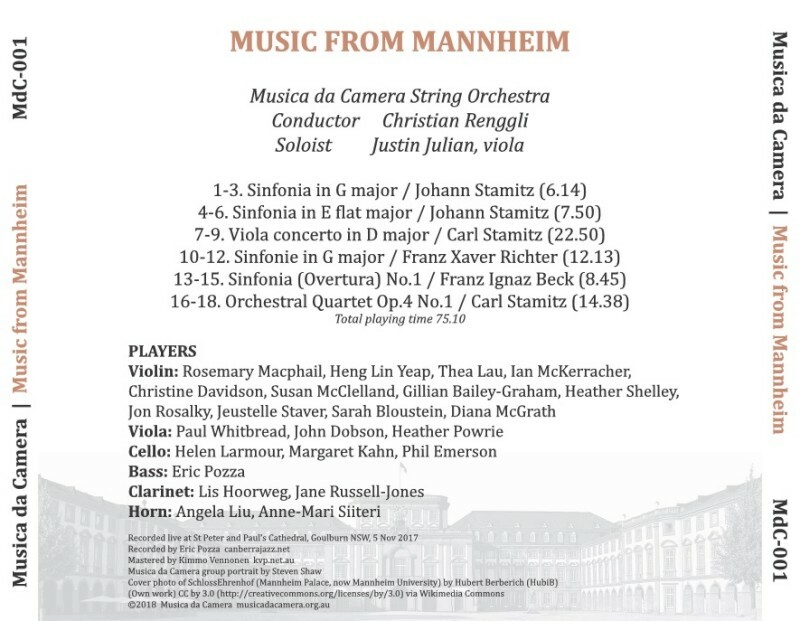 Very exciting, too, that one work, Johann Stamitz Sinfonia Ebmaj (WolS.I Eb-10; not Op.11 no.3 which is common), seems to not appear anywhere on YouTube, Spotify or Naxos. You can now catch some of this as a video on YouTube (search under "Musica da Camera Canberra") or better, buy a CD. Very reasonably priced. 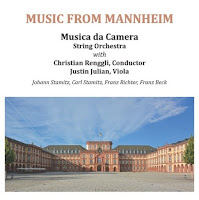 Musica da Camera received its CD release, Music from Mannheim. 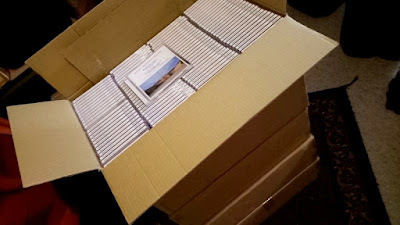 The CD will be launched with a free public concert at the High Court on 15 April (bookings required, from High Court website under About>Concerts). It was clearly different back then. Virgins, unicorns, lions and the rest. 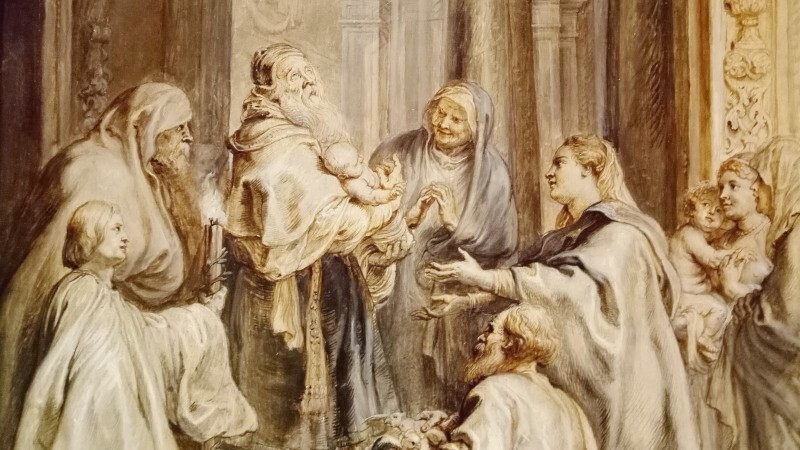 Strangely, they still concerned themselves with these things, but virgins were expected and inevitably horny creatures were everywhere in abundance. 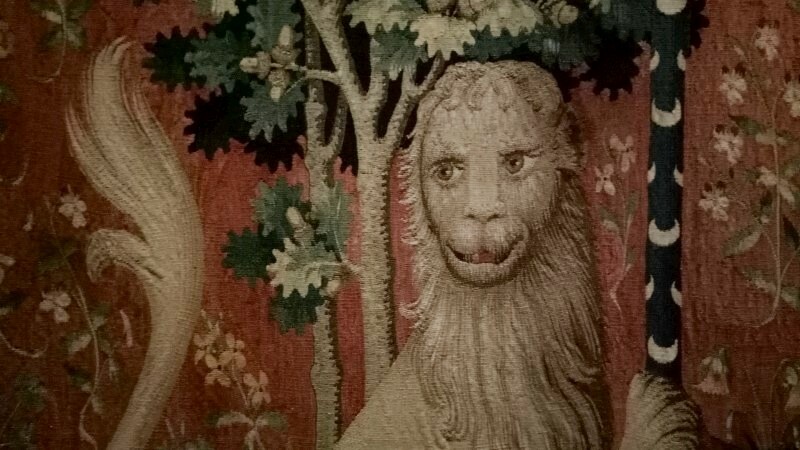 Or at least one unicorn and one lion and lots of flowers and a few dogs and rabbits and the like in every tapestry. 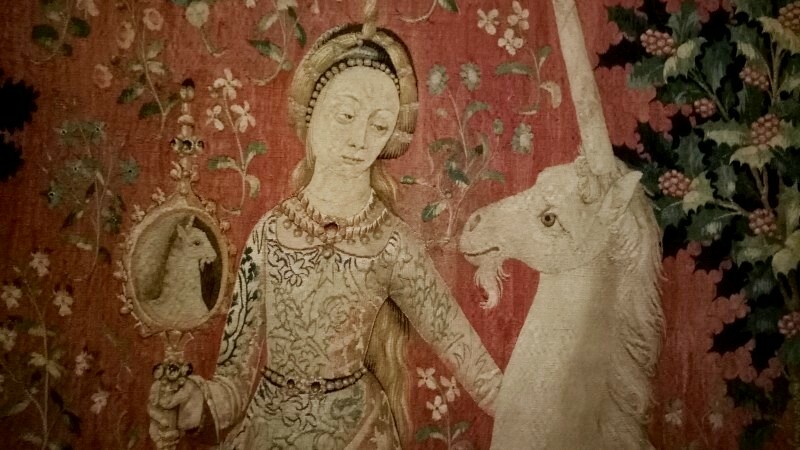 This was the famed French Lady and the Unicorn tapestry series on show at the Art Gallery of NSW. We'd gone down to Sydney for other things but also this. It was a mercifully little exhibition but fabulously important and weirdly diverse. 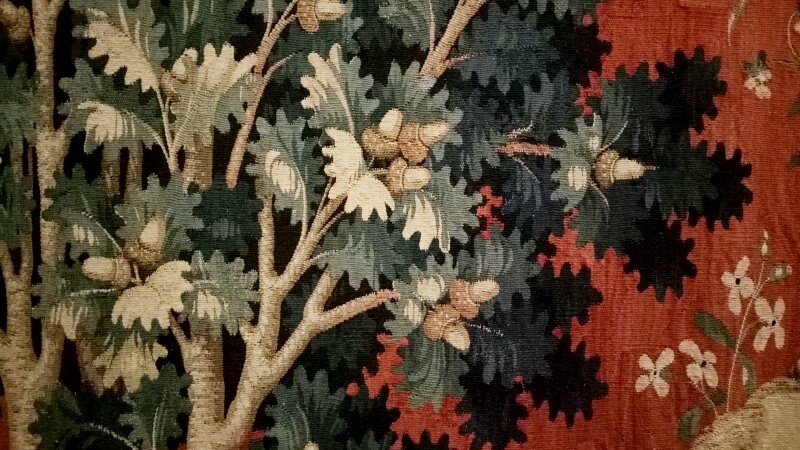 The series is 6 tapestries of much the same size, each perhaps 3m square. The first is called My sole desire with the young woman fronting a pavilion with the inscription Mon seul desir and attendant, dog, lion and unicorn, flags and the rest. 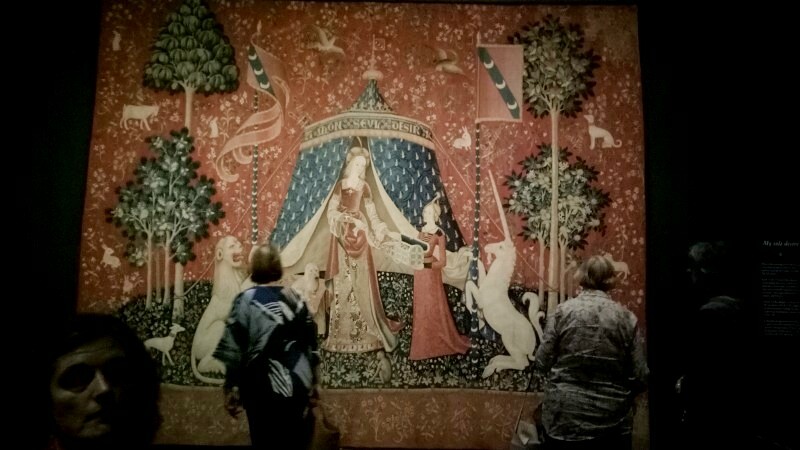 Then five other tapestries labelled Smell, Touch, Taste, Hearing and Sight, each with the woman and the unicorn and lion and millefleur plus more. Each item symbolises something, love or fidelity or cunning or innocence or strength or chastity or whatever. We don't get this, of course, but it's lovely and delicate and immense work (est. 2.5 years work for 2 weavers). Sadly the colours are faded and there are repaired rat bites. The backs, protected from the light, display more vivid colours but they are not on show. But I love this odd, unfamiliar era which is the European middle ages. This was very late, ~1500, another world to our rational, open times, but still with some strangely common concerns. What a pleasure to see something like this so close. And then a quick run through a few other rooms. 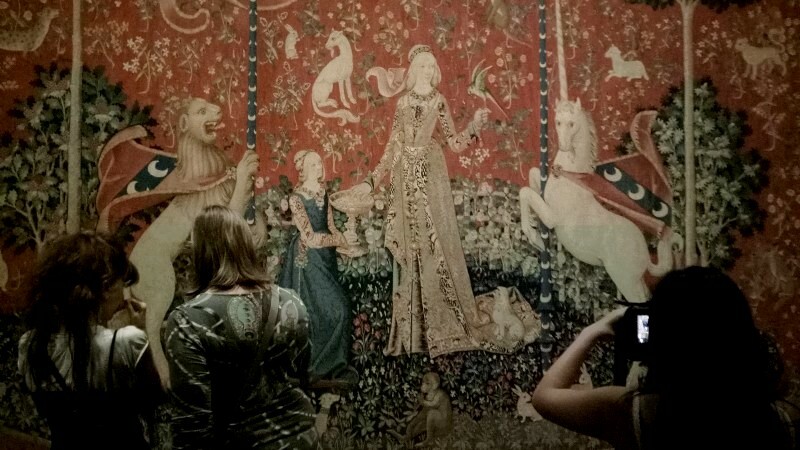 The Lady and the Unicorn tapestries are on loan from the Musée de Cluny (Musée national du moyen Âge) in Paris at the Art Gallery of NSW. JS Bach St Matthew Passion was performed at St Christopher's Manuka Canberra Choral Society and Australis Voices, two orchestras led by Pip Thompson and BJ Gilby with solo voices Robert Macfarlane (Evangelist), Jeremy Tatchell (Jesus), Greta Claringbould (soprano), Maartje Sevenster (alto), Christopher Roach (tenor) and Andrew Fysh (bass) under Andrew Koll (conductor). This was Matt Withers and Callum Henshaw performing Rodrigo Concerto Madrigal at Wesley with Anthony Smith on piano. 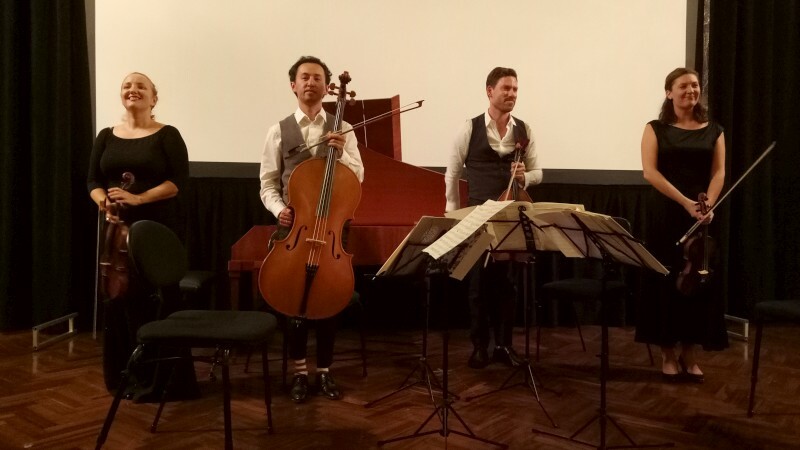 Matt joked that Anthony was their orchestra on the day then went on to invite the audience to hear this work in a few weeks with a full orchestra, in this case, the National Capital Orchestra in Llewellyn on 7 April. I'm in that, so this was a pre-visit/preview for me too. Not that we haven't played it through a few times and listened to other performances. But it's something special and a bit unusual to hear the concerto you are to play, performed in this format by the very people who will lead. It was an eye-opener. I was surprised by the extent of the work (12 movements over ~33mins), but not by its endlessly Spanish character and dancing rhythms and tangy guitar tones. Matt and Callum played well together, looking up for solo lines or ends and starts but otherwise intent of the complex, chordal charts that are guitar scores. Being a string player, I also enjoyed the quick lines of fretted notes high up the neck, especially when the two came together, in harmony or unison or jagged echoes. Guitar is plucked so sharp and so unlike other strings with their genial attacks and long sustains. This is all tack-sharp, cutting, alive and biting as we imagine the tap and snap of Flamenco and other Spanish styles. Looking forward to a night of this with Matt and Callum soon. 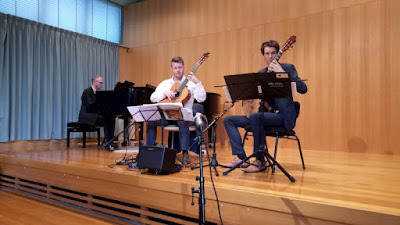 Matt Withers and Callum Henshaw (guitars) performed Rodrigo at Wesley with Anthony Smith (piano) accompanying. PS. 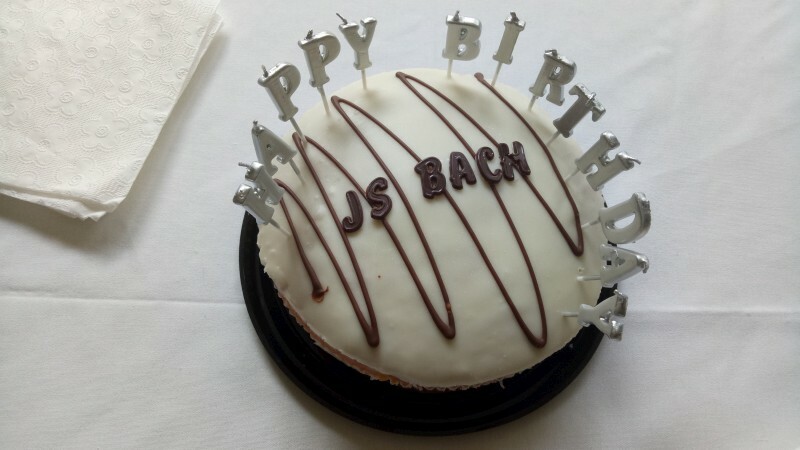 Wesley had baked a cake for Bach's 333rd birthday on 21 March 2018 (in preparation for a birthday organ concert that evening). It was gloriously satisfying to hear Louse Page and Sally Greenaway in the cabaret act, direct from the Adelaide Fringe. It was a presentation of about a dozen songs called Louise and Sally do Tin Pan Alley, dedicated to the wondrous tunes that came from that street in NYC, 28th St between 5th and 6th Avenues. I strolled down there once but there's nothing much there now but memories. But what fabulous memories are the great tunes from theatre and film that spread to the world and formed much of the infrastructure of jazz over the decades. The Gershwins, Ellington, Arlen, Kern, Porter. I enjoyed this deeply for the tunes and their outwardly innocent but wickedly playful and aware lyrics but also for the performances. Louise presented with clarity and trained voice as only her training can muster and portrayed every word with clarity and insight. Sally was a dream. She's a composer so she knows alternatives better than most, picks them with wisdom and portrays them with training. I love the bebop turn-it-on-its-head approach too, but Sally could portray the tunes in their original voice then play with them in a clever but empathetic way that floored me, even down to the collapsed dissonances of one tune or the quotes from James Bond or Rhapsody in Blue or a string of tunes built on Rhythm changes, not least the Flintstones theme. I noticed that once before with another jazz gig she did. To some degree, all improvisers compose but not like a composer improvises. Huge pleasure. Then there was the story of the songs, the insertions of a few further inventions of Sally, a take on a Bach Two part invention (no.8, Fmaj) as rag time and an original from her Seven inventions show telling the story of the emergence of movies which works a treat. These are two wonderfully trained and experience musicians doing cabaret with real, deep class. Suffice to say, I was both floored and touched. 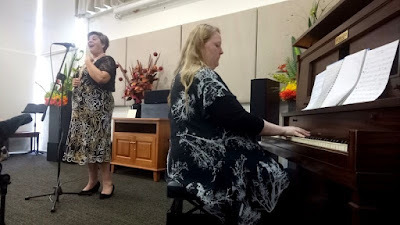 Louse Page (soprano) and Sally Greenaway (piano) presented their ode to the great American Songbook and its place of origin, Tin Pan Alley. It was the best of seats, it was the worst of seats. Or maybe not. This was the Australian Chamber Orchestra being led by Russian/English violinist Alina Ibragrimova from violin. Megan got given tickets from a friend who couldn't use her seat and I bought another in the back row. Seriously the back row: last row at the top upstairs. I didn't expect too much but the sound was very presentable, full, rich, more so than I've encountered in closer rows upstairs. The wall behind must do it. So I was pleased. Not so much for the Samuel Barber Adagio for strings, lovely as it was and how well played, but it's a non-fave of mine. But I noticed the neat playing, the precise intonation, the common sense of time, the intensity at low volumes, the neat dissonances. So not a favourite but looking very presentable. Then Mozart Adagio and Fugue Cmin. Busy and clear and falling over itself as fugues are. Loved that one. Then Hartmann Concerto funebre. I was non-plussed early but then startling playing, heavenly high harmonics, huge understanding between players and the modern harmonies got me. I was won over. Then interval. I'd noticed empty seats in the stalls, so off to front row. A nice chat with one couple then a search for a seat to view the bassist. I ended up somewhat unaccepted for my intrusion into someone's unused seat (I wondered why) but mightily impressed by the best seat in the house to view bass substitute Tim Gibbs (of the Philharmonia Orchestra [from where, Sydney?]) on bass. (Looking at the ACO website I write this, I reckon that TG was playing the famed 1585 Gasparo Da Salò bass: ACO make a big thing of their valuable and aged instruments). This time I was amongst the players. Watching their eyes and messaging; hearing the individuals; watching Alina herself up close, calm but sharp and quick and energetic in her playing (one player commented on her director's energy as I walked out with him); bowled over by some mighty lines on bass and celli; watching technique and checking string choices (D'Addario Kaplans? silver grey with dark windings) and how he used that bass extension. But the glances and awareness were perhaps the biggest lesson. That's what you see up close, amongst the players. Fascinating for others, too, as confirmed by mates also close and also players. 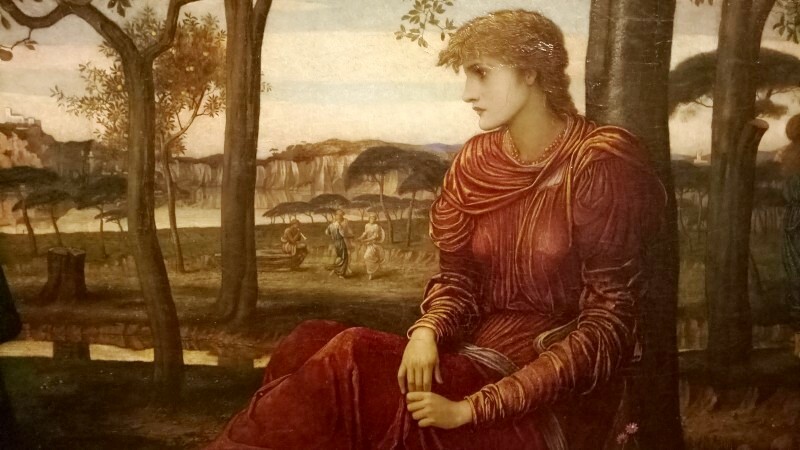 The second set was Arvo Part Silouan's song then the main work, Schubert Death and the Maiden, symphonic in scale with four movements, originally a string quartet (no.14, Dmin) but arranged by Richard Tognetti for string orchestra. This was another stunning achievement. Afterwards Megan likened ACO to Berlin Phil. Another friend said it's the thing he attends before all else. I can see why. Seriously good; obviously our own local piece of world classiness, touching on Canberra every few months. I must include ACO in future bookings. A stunner from either seat. Canberra has had a minor influx of players in the last year or so and we've been well served by it. Barrett, Clarke & Sutton are amongst the best anywhere and we had it, just a trio, mostly playing jazz written by others, but with a level of ability that was stunning. This is Hugh Barrett, Brendan Clarke and Mark Sutton. All three renowned throughout Australia and now resident here. There were a few originals; there was lots of hard swing and passed fours and bass solos and vamps. All the standard take on jazz tunes, but with such facility, such immense awareness and fluidity. I was laid low by Brendan's solos, gasped at Hugh's earlier dissonances developing into flowing waves of notes, grinned at the ease of Mark's telling stories on drums, not least surprised by those extra bars at the end of I remember Hugh/you. They mostly played music by others but the tunes weren't too obvious. 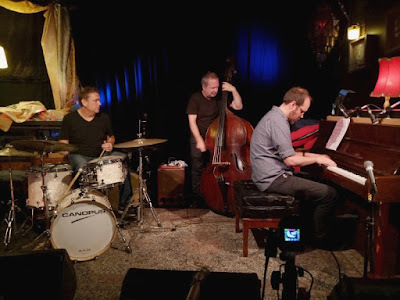 There was Coltrane but it was a blues called Just for the love; there was a string of tunes by pianists: Mulgrew Miller, Benny Barron, Kenny Werner, Bud Powell, Stephen Scott; there were a few by Cole Porter and Billy Strayhorn. Hugh provided two: Big staircase and his take on I remember you which easily took the nickname I remember Hugh. And I was floored by Hugh's solo intro to Lush Life: just right, in style and harmony with just a tasteful touch of dissonance with some diminished fills (if I heard right). Floored all round by some incredibly capable playing mixing seriousness with good cheer. Barrett, Clarke & Sutton just floored me. It wasn't totally unexpected. 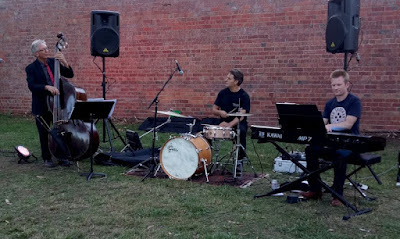 Hugh Barrett (piano), Brendan Clarke (bass) and Mark Sutton (drums) performed at Smiths Alternative. It was a big claim to make (and presumably a playful throw-away) that this was "one of the most beautiful pieces ever written" but it was lovely and the playing was easily up to it. 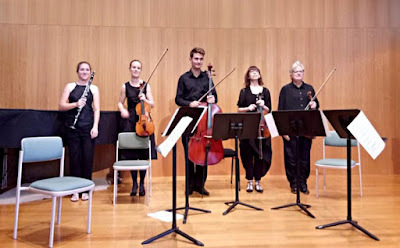 This was a group led by BJ Gilby performing Brahms Clarinet Quintet Bmin Op.115 at Wesley. I left with Pip and she said playing chamber music with friends was the best way to spend an afternoon. I could understand that whether the music is best ever or not. But how nice was this? The gentle interplay of a string quartet with the oddly insistent and unrelenting tone of the clarinet. I hear clarinets often enough but here it was frequent and prominent and that tone was so diverse from the strings: sustained but fatter, rounder, touching on mediaeval I thought. And the playing was lovely, not unexpectedly. Relaxed and easy but done with awareness and care. Barbara is leading us in MdC at the moment and I'm seeing her approach to preparing a group: slowly, highlighting surroundings and other players and understanding how the lines fit together, interweave, respond to each other. Not at all bull-at-gate, take it from the top. The performance was like this. Clear in intent, spacious and ready for changing lines and leads. So, if it was the most beautiful music eva, maybe so, but I just sunk into the pleasure of an afternoon of melody and interplay done with thought and awareness. That's my greatest ever. 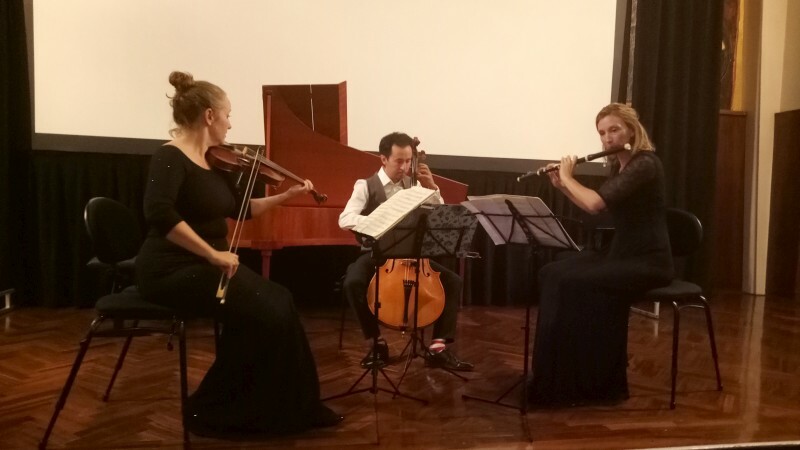 Eloise Fisher (clarinet), Barbara Jane Gilby and Pip Thompson (violins), Lucy Carrigy-Ryan (viola) and Samuel Payne (cello) performed Brahms at Wesley. If I search it right, IMSLP offers a list of 89 Stabat Maters by different composers so the annual SM performance by Adhoc Baroque has a few years to run yet. This year the composer was Alessandro Scarlatti (his son, Domenico, later wrote a better known setting). The text was by Jacopone del Todi and recounts the grief of mother Mary at the cross of Jesus. It's a deeply touching thought and thus taken frequently as a theme. The work itself comprises 19 short stanzas, sung by soprano and mezzo-soprano, Greta and Maartje, with accompaniment from organ, two violins and cello. The movements were short, often just a single reading of the text, perhaps a minute or two, sung by one or other or both vocalists. I particularly enjoyed the harmonised singing. Greta and Maartje both present well as soloists but I was particularly taken by their harmony singing in this performance: harmonising, contrapuntal, always clear and well formed, deliciously intoned and fluidly melding. The accompanying organ was discrete, the two higher strings playful and the cello firm and forward moving. In the notes, Peter highlights harmonic and melodic twists in this music with echoes in more modern music: he specifically mentions an off-beat melody in one movement which I remember hearing as an oddity (or error?) on the day. 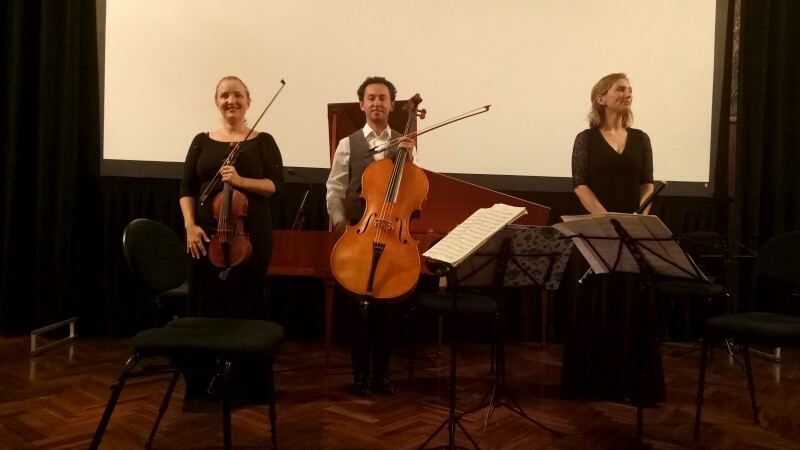 Otherwise, the group, with cello replaced by viola da gamba, performed three pieces before interval - a melancholy motet by Stradella, one of 1750 surviving church cantatas from Telemann and a lively playful piece from Buxtehude - with mezzo, soprano and paired voices. Again, some great playing and very satisfying singing of this unpretentious and deeply faithful C17th music. May the series continue till its natural end! Adhoc Baroque performed Stradella, Telemann, Buxtehude and a Stabat Mater by Alessandro Scarlatti at St Paul's Manuka. The group comprised Greta Claringbould (soprano), Maartje Sevenster (mezzo-soprano), Lauren Davis and Michelle Hicks (violins), Rachel Walker (viola da gamba), Clara Teniswood (cello) and Peter Young (organ, director). Thanks to CJ's Belgian foreign correspondent for a few pics. Foreign correspondent? Well, Neal has reported for CJ from jazz festivals in Belgium. 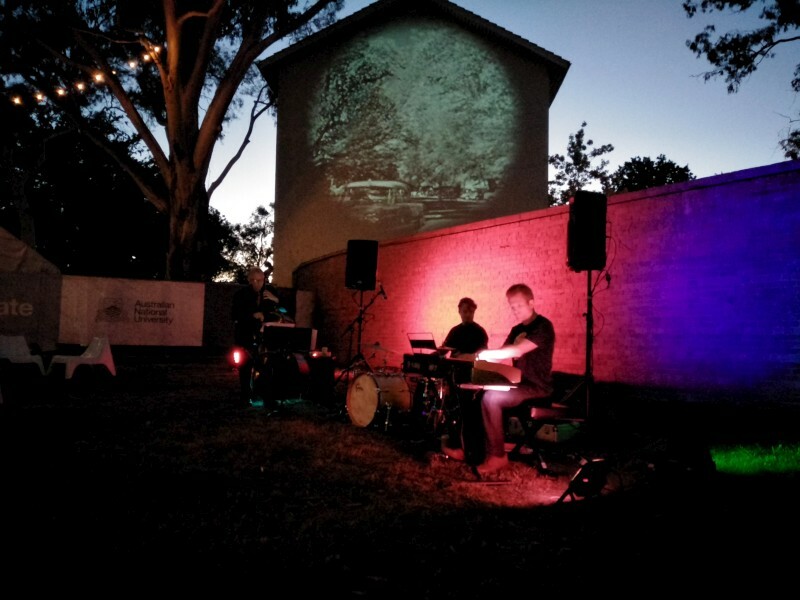 This time, Neal and Anne Gowan turned up at our Tilt gig at ANU Enlighten and provided some videos. Nice to see friends at a gig although I find it the most nerve-wracking of any visitors. It was a perfect night for it; the PA was supplied; there were lights and even B&W movies projected above us; we enjoyed playing. I played double and was enjoying it so much I didn't manage my funk-switch to e-bass. We met various audience, not least a Swiss PhD student of dwarf galaxies over for a visit to Mt Stromlo. He'd just flown in, learning of the hell of the flight to/from Europe, and told of being amazed by the local wildlife. Europe's left that way in the past. Enlightened. 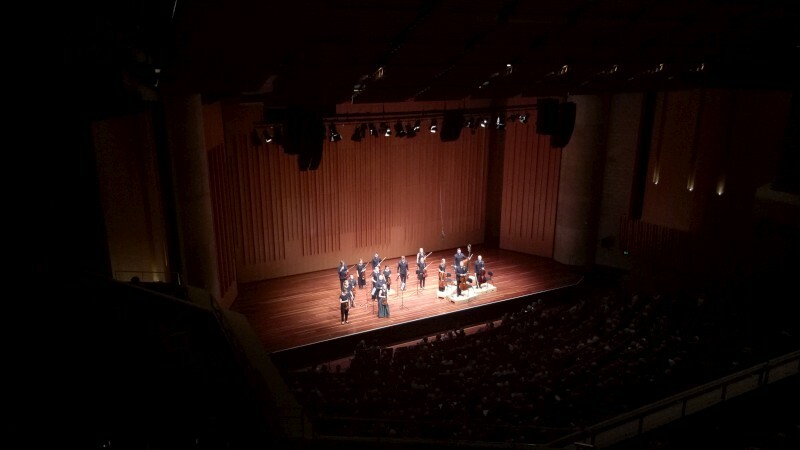 I sat in admiration listening to the Australian Haydn Ensemble this night. It's not the first time, but it surprises me each time. I'm playing music like this now so I can feel just how difficult and inspirational is this close interaction. They all play wonderfully, of course, but the stunning thing for me was the dynamics and the close interplay. This is a group thing, a matter of togetherness, shared understanding, often of friendship or at least musical closeness. Simone shows it openly, with frequent smiles and grins. The others smile and glace less obviously or frequently but they are all eyes and ears, too. You see it as they come to a pause, or the end of a phrase, how they look up to Skye or each other. Then the exact attack, the shared fortes or denouements, at the most detailed level, within and between phrases. This is close playing and it's a key to chamber music with its intimate scale and unprotected exposure. They just did it so well and so comfortably. Jacqueline was unavailable so this was played without bass, interestingly, as much of this early classical music was written. 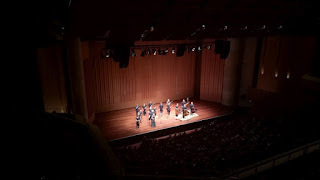 The program was all Haydn: London Trio (flute, violin and cello), a string quartet and the Symphony no.104 London. The trio was written for home playing. I could only sit aghast thinking of the demands placed on home musos. But there was no TV in those days, so plenty of time for practice for the comfortable classes. Some lines just flawed me: from Anton's cello, or Skye's lead or Simone's responses or just how the whole group stopped then seemed to float for a lengthy pause, twice, I think, in the final movement of the symphony. I've said much of this group as they are friends and I've seen them numerous times, but I am never unsurprised. Truly lovely stuff. Australian Haydn Ensemble performed in the Great Hall at ANU University House. 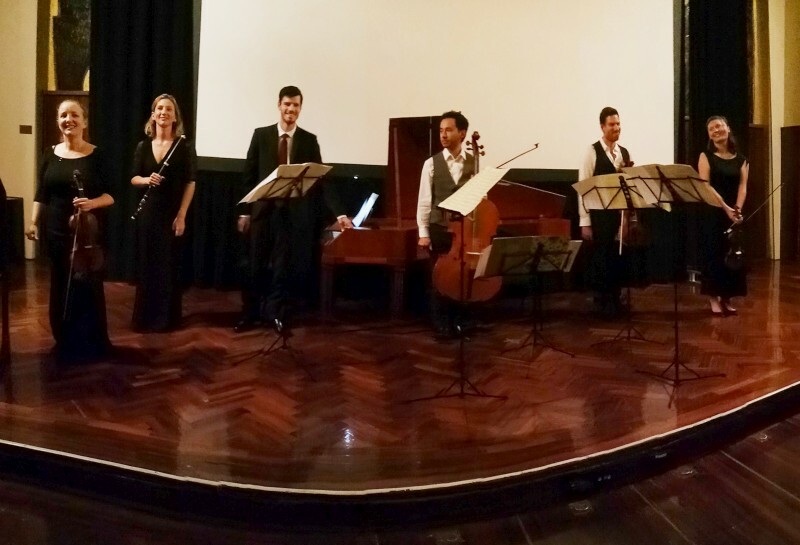 AHE were Skye McIntosh (violin 1), Simone Slattery (violin 2), James Eccles (viola), Anton Baba (cello), Melissa Farrow (flute) and Nathan Cox (fortepiano). We were off to a classical gig but the ANU was enlightened for the Enlighten Festival and we ended up snacking outside listening to As Famous As The Moon. This was opportune as Tilt was to play there the next night, so I could survey the joint. But best was their playing, of course. These are seriously satisfying players. Dirk was on leave so Joseph Taylor was filling in for the night, with the standard drummerless pairing of Lachlan and Graham. These guys have played innumerable gigs (actually, they are counted and AFATM are well over 3,000) and continue to do so, regularly, as a local institution. The tunes are standards and the playing was exemplary. 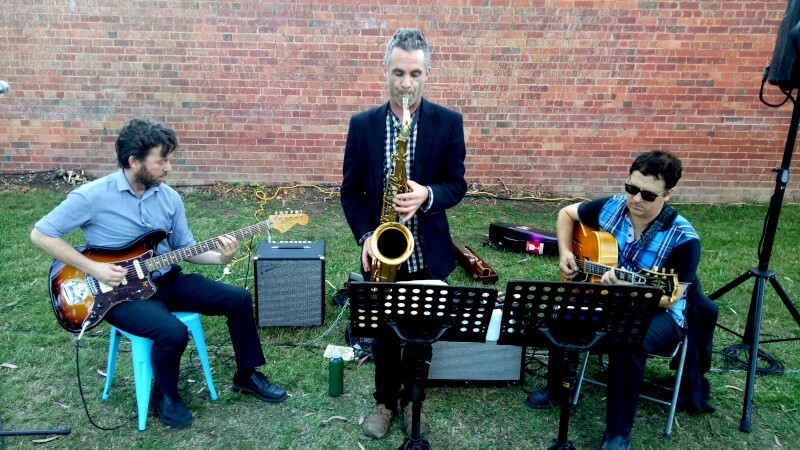 Lachlan's quick 6-string bass work and Graham's crisp guitar and Joe's exploratory and often insouciant and lithe tenor and soprano. This was some stunning playing and just another proof of the potential of the standards repertoire (as if we need that). AFATM may serve a lovely background but it's worthy of some intense listening, too. As Famous As The Moon appeared at ANU Enlighten festival with Joseph Taylor (tenor, soprano saxes), Graham Monger (guitar) and Lachlan Coventry (6-string e-bass).